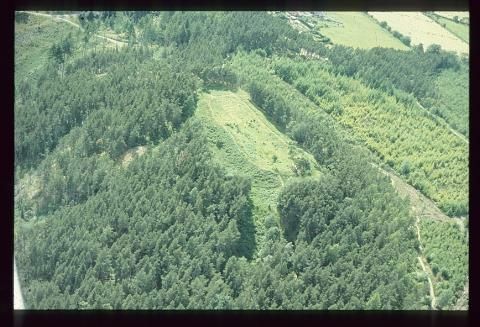 The hill fort at Craig Phadrig is one of the best known and most intensely investigated of Scotland’s vitrified forts. The nature of these forts has long been a subject of controversy and their unusual characteristic of vitrified stone has drawn much interest over time. Sadly much of the information gathered about Craig Phadrig over the years has been lost but it still provides an interesting insight into the evolution of archaeological thought. One of the main reasons for Craig Phadrig being an often visited site is its prominence and relatively easy access. 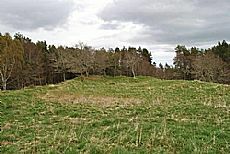 Situated in the west of Inverness and overlooking the Beauly Firth the strategic advantage as well as visibility of the fort is clear to see (NH 6400 4529). 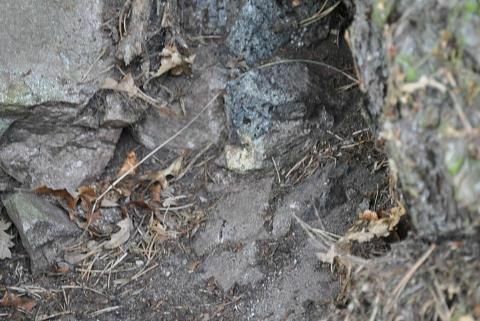 The first investigations took place in the 1700’s including the first excavation in 1777, when the main debate centred around whether or not it was a volcano. This highlights the strong connection early archaeology had with geology and the men who investigated were not restricted to one field of thought. Modern archaeological investigation took place at the site in 1971 and although only small areas were excavated a fascinating narrative was uncovered. It seems the first significant human activity on the hilltop occurred in the Iron Age, with the construction of the ramparts around the 300’s BC. They were timber laced and up to 6m thick and 8m high with an estimated 25,000 tons of stone used. It is unclear what may have been going on inside the walls but no evidence was discovered for occupation before the walls’ monumental destruction. The act of vitrifying a large rampart is notoriously difficult as many modern reconstruction attempts have shown. It is estimated that at least parts of the walls at Craig Phadrig reached 1200 degrees Celsius, melting certain types of rock. The effort to produce this effect and its purpose can only be speculated at, but its visual impact would have been immense. It is only after this event that occupation layers were discovered by excavators dating to 200-300 AD. The final stage of occupation at Craig Phadrig and the finds from it have made it most famous. This is the Pictish occupation of the site estimated at around 400-600 AD. During this phase excavators discovered evidence of high status metal working, including an escutcheon bowl mould. This implied a high status Pictish site and it is due to this that it is often linked to King Bridei and St Columba’s visit to his capital somewhere in this area. The dates could just fit (although they are a little stretched), so it is just possible that when standing on the hill today you could be standing in the fortress of a Pictish king and where St Columba stood over 1000 years ago. Highland HER: This contains a number of photographs, good bibliography and links to some reports . Site report: Small and Cottam, A and M B. 1972. ‘Craig Phadrig: interim report on 1971 excavation’ University of Dundee, Dept of Geography, Dundee.